These days it’s easy for education marketers to get discouraged about the state of higher ed. Some prospective students are dubious about the cost and ROI of an advanced degree. Students are borrowing too much. The economic recovery and job growth is slow. Increased competition and a sluggish international economy have slowed foreign applications. But it’s not all doom and gloom. The good news for business schools is that the master’s and MBA degrees still provide value where it matters, career outcomes. That’s what business school graduates reported in a research report conducted by LinkedIn and Carrington Crisp. The key for business schools is to focus on quality and empower success from the very start of the student journey – and social media can help. 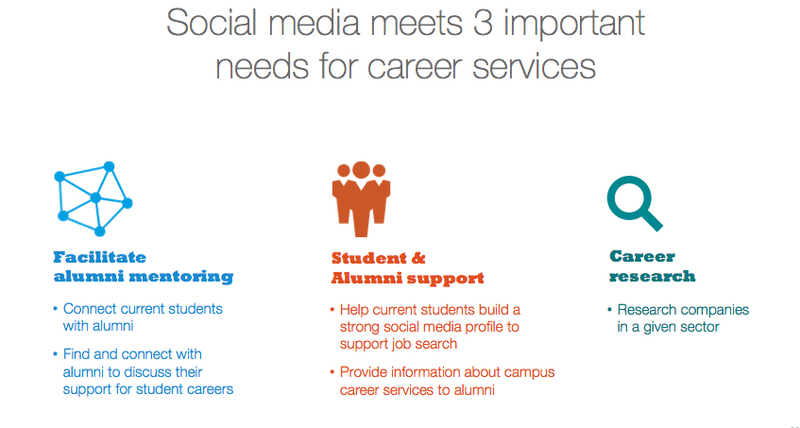 To help education professionals create a roadmap for reaching high-quality prospects and boosting alumni success, LinkedIn and Carrington Crisp embarked on a research analysis entitled Quality Leads to Successful Graduates: Using social media to improve lead quality and alumni success. Carrington Crisp, a higher education market research and consulting firm, surveyed 325 business school admissions and career services staff globally, including 90 in the U.S. and 25 in Canada. Separately LinkedIn conducted an online survey of 9,898 members across 12 countries, including 469 in the U.S and 346 in Canada. In this article, we’ll examine the U.S. and Canadian findings. a) Business schools are very social. Social media usage is extremely high among surveyed business schools, with 71% of admissions professionals and 98% of career services professionals using some form of social media on the job. b) Business schools rate LinkedIn first for finding quality candidates. 88% of surveyed admissions professionals rated LinkedIn first in finding top student candidates, followed by Facebook (35%) and Twitter (24%). c) The master’s degree is still valuable. Nearly 9 out of 10 graduates surveyed said their degree had a positive impact on their career. What’s more, 73% of graduates are very or extremely satisfied with the impact their degree has had on their career. d) High grit professionals are more satisfied. Graduates who scored high on the grit scale – Dr. Angela Lee Duckworth’s famous measurement of resilience and perseverance – were 37% more likely to be satisfied with their master’s degree than their counterparts who scored low. e) Specific goals lead to greater success. Graduates who were driven by more tangible motivations for earning a degree, such as salary or career advancement, were more likely to report feeling successful career outcomes and satisfaction with the impact of their degree. With the increased scrutiny on career outcomes, universities today are under tremendous pressure to prove the value of a degree. That’s why a successful enrollment strategy should consider the lifetime value of a student. Today, you need a plan that encompasses the entire student journey from prospect, to successful student, to satisfied alumni. As we see from our research, business schools are turning to social media to help support all stages of the student journey. 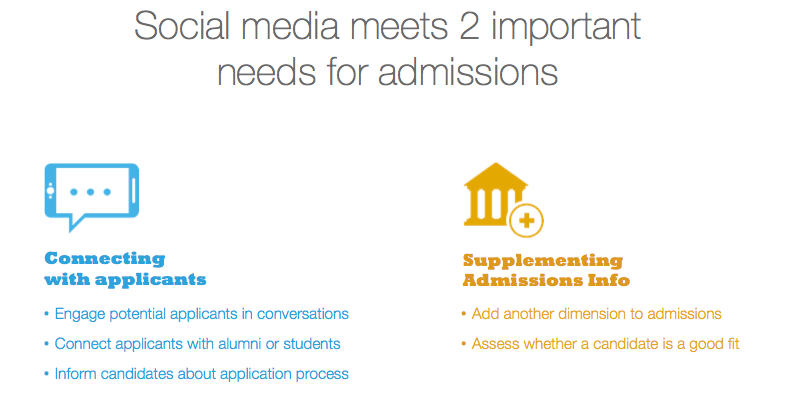 For admissions teams, social networks solve two key needs: connecting with prospective students and supplementing essential information in applications. Interestingly, LinkedIn and Facebook are the two social networks used most by admissions teams, and LinkedIn was rated the best social network for finding the best student candidates. They defined “best candidates” as those with a strong fit with school culture, a CV with strong attributes outside of studies and work, and likely to actively contribute in class. Social media is put to even greater use on the career service side, as 98% use social, and LinkedIn is again the leading social network used at 93%. Key uses include alumni mentoring, supporting students in their job search, and career research. Based on our findings, higher education marketers are increasingly using LinkedIn to improve quality from the very beginning of the student journey to graduation and beyond – building a virtuous cycle that translates to more engaged alumni, positive career outcomes, and referrals. 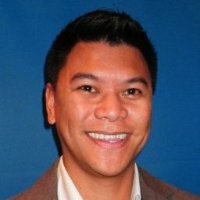 LinkedIn can provide a valuable touchpoint with students and alumni to break down internal silos and better prepare graduates for success. Find quality candidates and engage them at scale on LinkedIn. Use tangible career goals to attract success-driven prospects, such as increased salary and upskilling for a new role. Broaden the content you share to include program info, faculty bios, alumni testimonials and news. Use LinkedIn Sponsored InMail to provide program info to targeted audiences and support candidates through the application process. Advise students on how to build a strong personal brand on LinkedIn and foster networking. Encourage alumni to give back as ambassadors to applicants, as student mentors, and by building an engaged alumni community. Higher education marketing is more challenging than ever. To inform your teams about strategies best practices to overcome these challenges, sign up for early access to our eBook today, and be the first to receive it as soon as it launches next week!